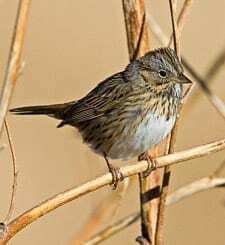 The dainty Lincoln’s Sparrow has a talent for concealing itself. It sneaks around the ground amid willow thickets in wet meadows, rarely straying from cover. When it decides to pop up and sing from a willow twig, its sweet, jumbling song is more fitting of a House Wren than a sparrow. Though its song might conceal its sparrowness, its plumage says otherwise. This sparrow looks as if it is wearing a finely tailored suit with a buffy mustachial stripe and delicate streaking down its buffy chest and sides.